All these caps are great for solid pack insulated metal chimneys as well as any reline pipe. Not for use with Air-Insulated Chimneys! 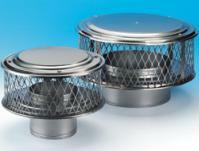 Browse these categories under "Caps for Solid-Pack Metal Chimneys"
Featured products under "Caps for Solid-Pack Metal Chimneys"